Is this a 1949 capacitor? Gibson ‘49 ES-5N content! 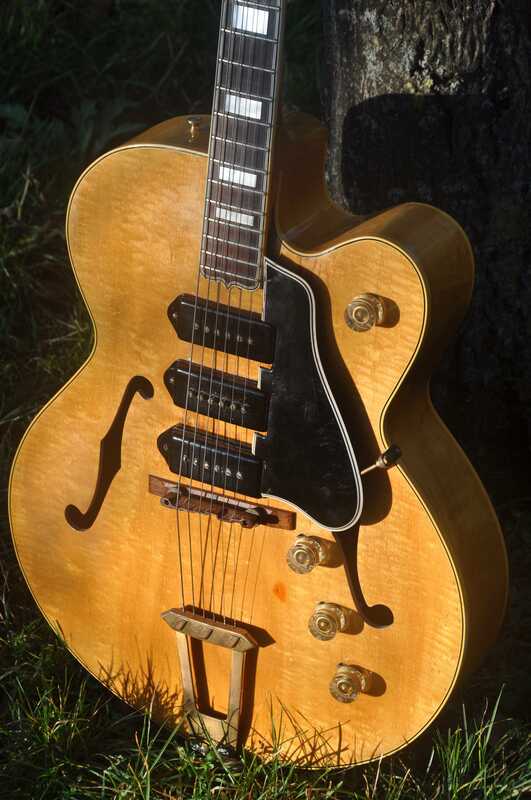 I own a 1949 ES-5N that seems to be all original (I have no reason to believe it is not). I'm the second owner, it has a known history and it's a fantastic guitar. The other day I decided to check the pots for date codes and they have a code that says week 18, 1949 (IRC). So far so good...but the capacitor on the master tone pot looks strange to me, never seen one before. It looks almost too new to be from 1949. It is a Gudeman capacitor with code 438940: 438 stands for Gudeman and 940 would be week 40, 1949. That could be just right because I know for a fact that the guitar left the Gibson factory after october 1, 1949 and was bought in Buffalo, NY on october 29, 1949. Week 40 is october 3 - october 9, so that is possible in theory. But again, the capacitor doesn't look 40's to me...on the other hand, the date code matches with 1949 (or 1959, or 1969, etc...but if it was changed later then it would be a big coincidence that it has a '9' in the code as far as I'm concerned). Everything looks to be original on this guitar: pickups, wiring, soldering, pots, etc...I just wanna know if the capacitor also is original. Is there anyone who has seen this type of capacitor before? Did they make and use them in 1949 or before? Any info would be great! That's an awesome guitar; a "white whale" model for me; a big box with three P-90s. You are a lucky guy. Haha, a 'white whale', I like that! It looks a bit newer to me. I'd expect something more primitive looking. Like in wax or some ceramic or paper style. It looks like covered in shrink plastic. But I could be wrong. Then again, I'm not a believer in capacitor magic. They are more or less the same to me. Hi Geoff. How are things over yonder? Are you coming to visit sometime? I bet we’d put together an impromptu Geoff Roundup in your honor. 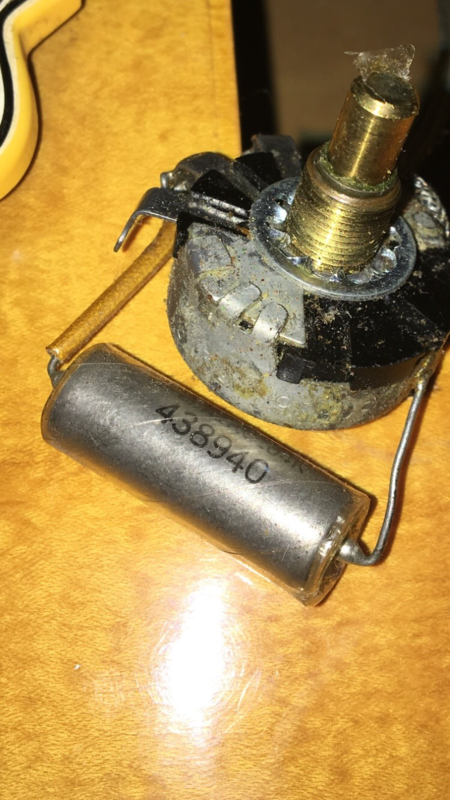 Hello 58dutchie, I was actually able to find a picture of a 1949 Gudeman guitar tone pot capacitor. It looks significantly different than the one in your guitar, and is more in line with the capacitors that I've run into restoring antique RCA radio sets and other antique electronic products. These old paper caps are wax coated, and have a tendency to dry out over time and leak, especially in high voltage circuits (but can last longer in guitars). All Gudeman capacitors, that I've seen have "Gudeman" printed on the side as well as the electronic value, this one is .01MFD (.01uf). That is a very nice example of an early Gibson, it's definitely a keeper! Thanks Wade! Actually, the cap in my guitar does have ‘Gudeman’ printed on it (not visible in the pic). I thought it probably did, but I mentioned it just in case. It looks much newer than the guitar. Did you take a picture of the solder joint? Perhaps that will tell us more too. Hi Proteus. I'm quite fine, thank you ever so much. I hope you are doing great. Work at the TV station is extremely bussy. I forget to live every now and then. But I manage! The Geoff Roundup as a concept is way too much honor already although I'm very proud such an idea exists. I once would like to visit America but I'd have to meticulously prepare a complete trip and all. Plus my wife demands a trip that's worthwhile for her too. So that is a potential danger for any guitar meeting. It would be cool to travel with four persons or so, and take at least three weeks off to see interesting parts of the US. If I can ever find people to come along, it might all happen. I would certainly visit many Gretschers and guitar heroes. Fwiw, here is a Gudeman capacitor purported to be from '49 with a different date code system. Wow I think I commented on this and my comment was removed???? weird! I removed it because you didn't buy me that guitar!!! Just kidding but that is weird though. I love that guitar......I feels like I would morph into T-Bone Walker should I ever own one! That's the same reference that I found spike, an old paper wax capacitor preportedly from 1949. IMHO, it fits the era properly, it is exactly what I see in antique electronic equipment of the 30's, 40' and 50's. They're the first thing I change out in old sets, along with the electrolytic capacitors. The were never meant to last 70 - 80 years.